[Herein I remind you, faithful readers, that these aren't reviews of the pilots in question. If they were, they'd be much longer and much more divided into paragraphs. In fact, I've pretty much decided that "paragraphs" would be the clearest distinction I'd give between a review and first impressions. Just as the pilots themselves are just a wee bit unformed, these first impressions are also just a wee bit unformed. That's not the same as being a wee bit uniformed, which would involve funny sailor suits, I suspect. OK. Enough of that. Not. A. Review. I'm not sure when TV critics are likely to get the next wave of screeners this summer. CBS sent out what it had. I covered that. NBC and ABC are still casting and tinkering and in pre-production and whatnot. The CW is shooting the "90210" pilot, but it's hard to imagine them rushing together a rough edit just to tease critics, at least not until we're a bit closer to Press Tour. So it may be a while before the next "Take Me to the Pilots" update. Nice of FOX, at least, to screen a rough version of the "Fringe" pilot for available scribes yesterday. FOX publicists wanted to emphasize its roughness, though it was complete enough that the effects work looked polished and the location identifying titles, a snazzy trademark for the series, are in place. 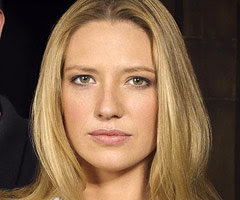 FOX is banking pretty highly on "Fringe," which will launch with an ambitious two-hour pilot and will then reap the rewards of a "House" lead-in. Put simply, I think they can be confident that "Fringe" will open. Where it goes from there? Who knows? But I sure preferred the "Fringe" pilot to either of the CBS drama pilots, which isn't really a good blurb, is it? The Pitch: "X-Files" meets "Altered States" meets "The Odd Couple"! Desire to Watch Again: High.